State Superintendent candidate Humphries took his privatization crusade further Thursday, announcing details to shift more resources to unaccountable private voucher schools and convert public neighborhood schools to them. MADISON - A strong public education system is key to opening the doors of opportunity for millions of Wisconsinites. 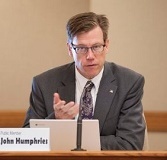 But right-wing State Superintendent candidate John Humphries is deadset on privatizing Wisconsin public schools and leaving students, parents, and educators behind. Humphries first rolled out a new report card system that gave most schools in Wisconsin an 'F' in academics, including his own Dodgeville School District where Humphries spent the last five years as an administrator. Today, Humphries took his privatization crusade a step further, announcing details to shift more resources to unaccountable private voucher schools and outlining his plan to convert public neighborhood schools to private voucher schools. "For decades, Wisconsin's economy and its residents benefited from a strong public education system based on excellent educators, motivated parents, and communities working together to provide our children with the preparation they need to be successful in life," Democratic Party of Wisconsin Chair Martha Laning said on Thursday. "John Humphries doesn't understand that and instead he is doing the bidding of wealthy right-wing special interests who seek to make millions on the backs of young Wisconsinites."